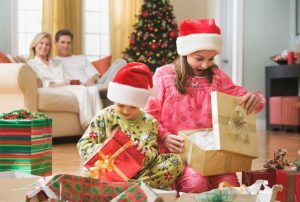 Dinosaurs – the unsung heroes of the video game world haven’t featured as heavily as most of us would’ve liked in recent years, as hordes of gamers want to control, shoot at, or run from our cold-blooded friends who never cease to remain awesome. Whether it’s playing as them or against them, the addition of dinosaurs seem to just make everything better, and the prehistoric reptiles’ past exploits and future appearances in video games can’t go unnoticed any longer. So let’s have a quick look at some previous and forthcoming dino-packed games. 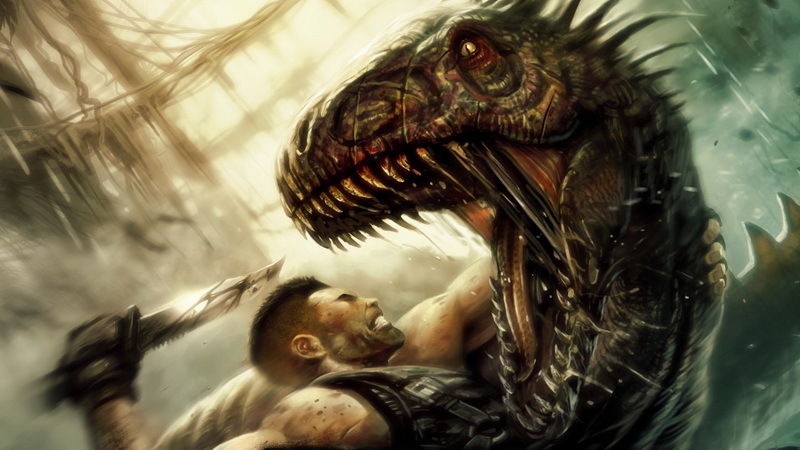 Off the bat, just mentioning the words ‘dinosaur’ and ‘video game’ brings to mind one name – Turok. The Turok series was extremely prevalent throughout the late 90’s and early 2000’s thanks to a strong evolution of the franchise. Playing as the Native American hunter, Turok, players have to protect a world which lies between Earth and the Lost Land, the latter featuring a host of some of the most veracious and majestic dinosaurs never seen in video games before. When Turok released on the N64 in 1997, it didn’t only change the way the once colourful family-friendly console was perceived, but it introduced the world to full 3D-rendered dinosaurs that although amazing to see, posed one of the deadliest threats seen on the medium. Turok did get a 2008 reboot on the PS3 and Xbox 360, and while the game didn’t wow critics across the board, the unbelievably life-like appearances and frighteningly realistic animations were quite a visual treat. Imagine an alternate reality where none other than Hitler himself has found a way to resurrect dinosaurs and use them in his Nazi reign of terror. 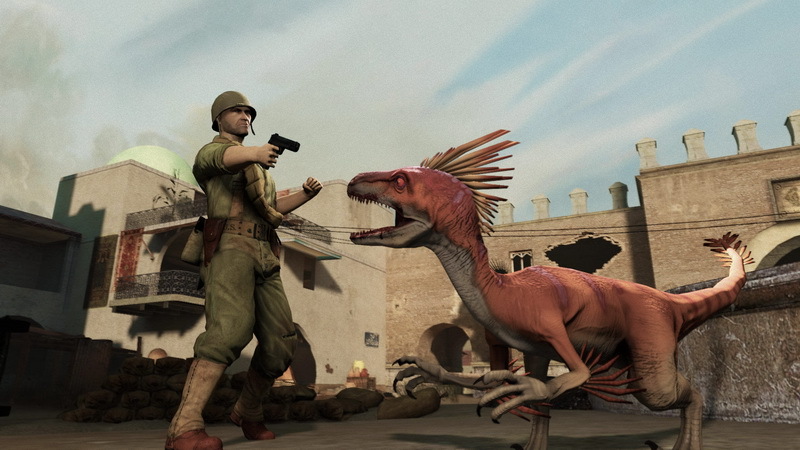 Enter Dino D-day, a fully-online multiplayer shooter (which runs on the Source engine) and allows players to either take the side of the Allies or Axis, each with their own special human and dinosaur classes. Cue chaos. The game does a good job at fusing two historical periods despite them being over 120 million years apart. If battling it out with a protoceratops with a mounted machine-gun on its back sounds like your kind of game, then check out Dino D-day in all its bizarre historical glory. 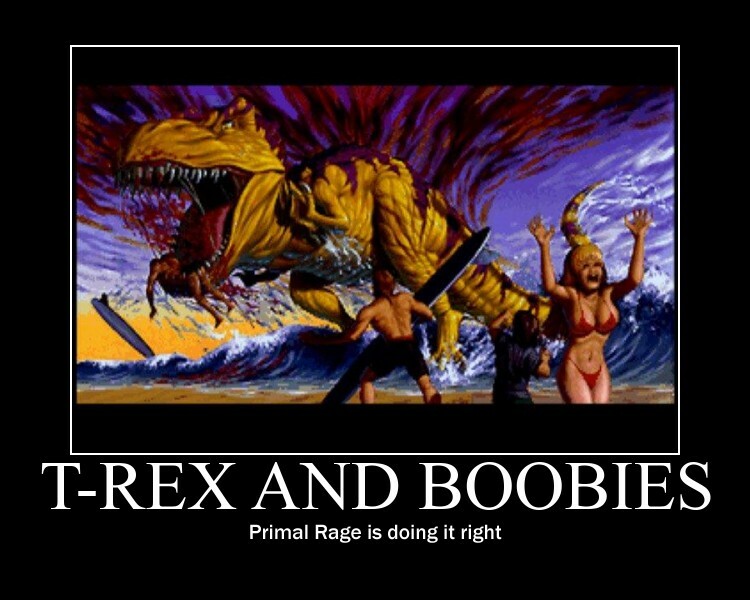 While not technically dinosaurs in the traditional sense, Primal Rage featured one of the simplest and most ingenious ideas in gaming history – let dinosaurs and other ancient species battle it out for the fate of the planet. 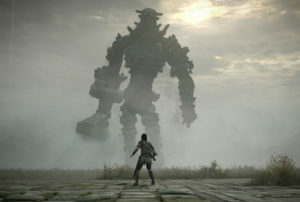 Allowing players to choose one of many giant beasts, players can bite, slap and generally just beat the hell out of one another, while managing to chomp down or crush cheering-human bystanders as they witness the future of Earth being decided by radiation-infused dinosaurs. Probably the most important and epic battle lies between the two dinosaur factions, namely Sauron and Diablo, of the virtuous beasts and destructive beats respectively. These two were the Scorpion and Sub-Zero of Primal Rage and kids would line up at arcades just to get a glimpse of the two titanic creatures going head-to-head with zero disregard for one another. Not an actual screenshot, unfortunately. While Jurassic Park is the undisputed king of dinosaurs in the film world, the franchise hasn’t really proved itself within the gaming community. Jurassic Park: Trespasser is an example of this, and even though it’s not a game you should consider revisiting (you really shouldn’t), it has some pretty interesting dino-filled moments. 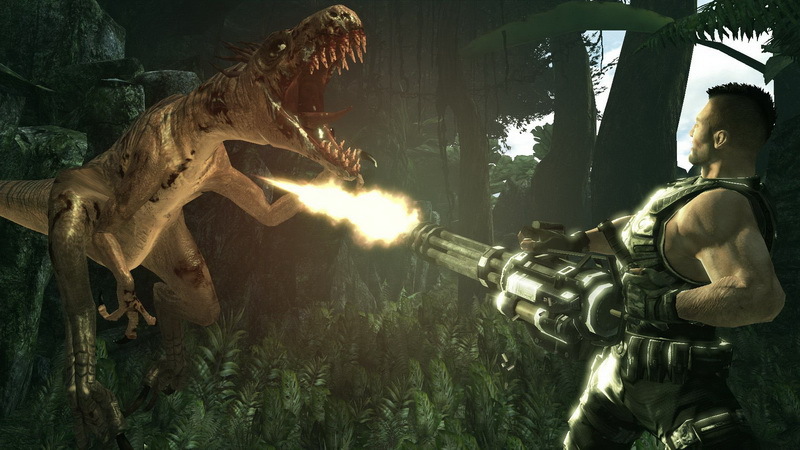 Players could pick up items around the large open environments and use them as weapons, such as grabbing a rock and beating a raptor to death with it. Trespasser wasn’t a great game, but being on the infamous Site B Island, and hearing that unforgettable musical score has some unexplainable draw to it. 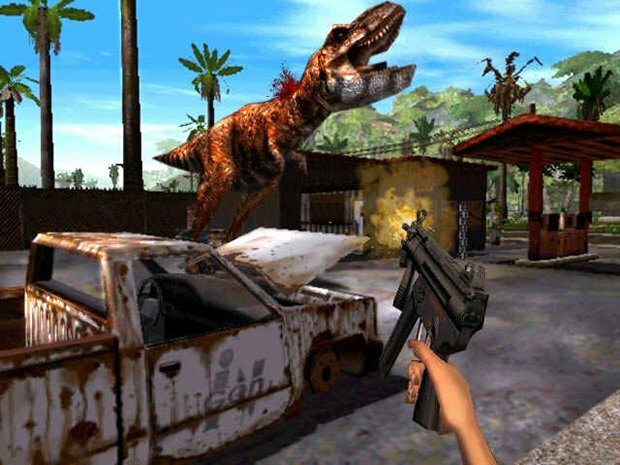 Speaking of islands, one can’t talk about dinosaur games without mentioning 1999’s Dino Crisis. Set on the fictional island of Ibis, Dino Crisis threw players into a dinosaur-infested survival horror produced by Resident Evil veteran Shinji Mikami. The game borrowed the creepy fixed camera angles and mechanics from the Resident Evil series in order to create a different, yet familiar experience to that of RE, but with dinosaurs. Some seriously frightening moments and sheer panic ensued as players had to fend off raptors with a handful of bullets and run from a stampeding T-Rex in order to reach one of three different endings. What does the future holds for our prehistoric friends? Primal Carnage throws players into a multiplayer deathmatch arena, selecting either humans or dinosaurs to battle it out for special supremacy. Orion Prelude is the first in a planned series of titles set to release (hopefully) this year on Steam, Xbox Live Arcade, and PSN. Notable mentions: Jurassic: The Hunted; ParaWorld, Yoshi (he’s a dinosaur). Have we missed an dinosaur related games? Let us know in the comments below and on the MyGaming forum.